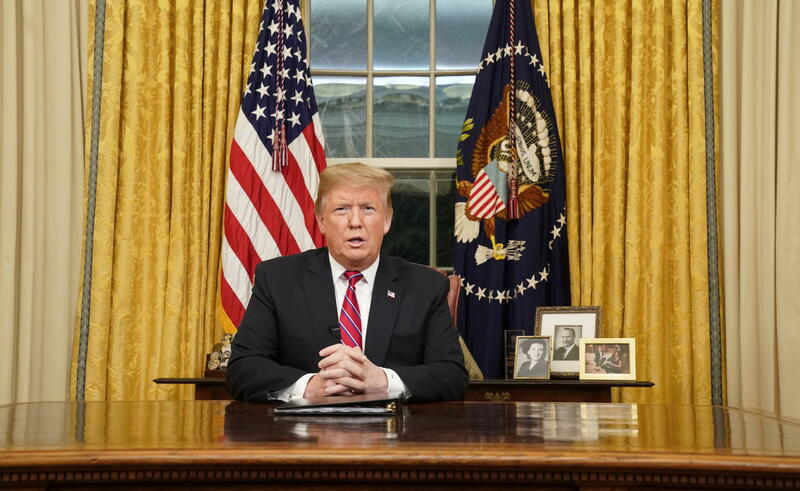 President Trump, pictured delivering his first prime-time address from the Oval Office on Jan. 8, hits the two-year mark of his presidency on Sunday. Sunday marks the second anniversary of President Trump's inauguration. At the midpoint of his four-year term, Trump has already delivered on some of his campaign promises, such as boosting funding for the military. Other pledges have been all but ignored, like his promise to lead a $1 trillion infrastructure push. With many of Trump's promises, however, the record is somewhere in between — not exactly "mission accomplished," but not "mission forgotten" either. Two years into his presidency, Trump has not built a wall along the Southern border. And Mexico certainly hasn't paid for it. 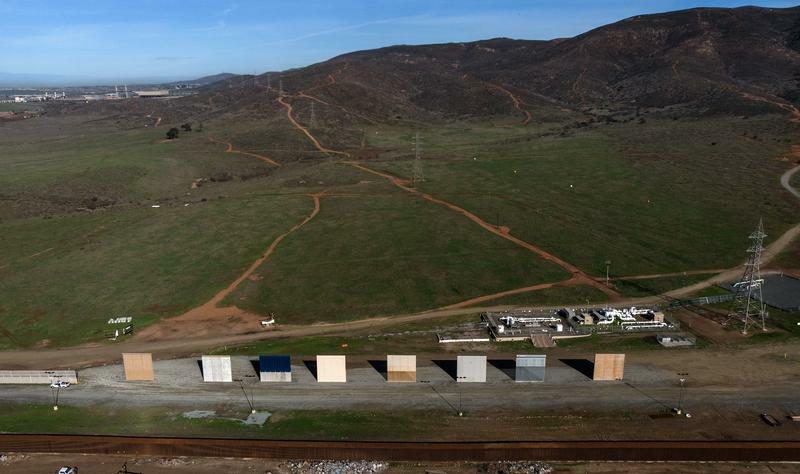 But the president continues to lobby for a wall, even going so far as to shut down part of the government in an effort to win funding for a 234-mile stretch of border barrier. The president has also pursued other get-tough measures against both legal and illegal immigration. "We've never had a president who has focused so much attention on immigration policy," said Andrew Selee, president of the Migration Policy Institute, "and so uniformly in the direction of trying to reduce the number of people coming here and removing those who are here illegally." Trump has slashed the number of refugees entering the country, tried to end Obama-era protections for young immigrants living in the country illegally, and after a few rewrites, he ultimately won Supreme Court approval for his travel ban. Trump has delivered on his promises to renegotiate the North American Free Trade Agreement and to withdraw from the Trans-Pacific Partnership, a big Asian trade deal. The new NAFTA, which Trump calls the USMCA, still needs approval from Congress. And 11 other countries in the TPP are moving ahead with their own agreement, putting U.S. exporters at a competitive disadvantage. Trump stopped short of labeling China a "currency manipulator" as he promised. But he has imposed tariffs on $250 billion in Chinese exports. Trade talks with China are ongoing. The president has also imposed steep tariffs on steel and aluminum imports and threatened to impose tariffs on imported cars. "These are all things that President Trump promised to do during the campaign — for better or for worse — and in my view he's very much followed through with a lot of them," said Chad Bown, a senior fellow at the pro-trade Peterson Institute for International Economics. Trading partners, including traditional allies, have retaliated with tariffs of their own on a variety of U.S. exports. The U.S. trade deficit, which Trump often complains about, has widened over the last two years. The GOP-controlled Congress passed a big tax cut just over a year ago, and that's contributed to a surge in economic growth. The White House argues that higher growth rates will continue for the next decade. But many other forecasters believe this is a short-term "sugar high" that will fade in the next year or two. There's no debate about the effect on federal revenues. The tax cut has reduced government revenues and contributed to a ballooning federal deficit, expected to reach $1 trillion this year. "We heard some people claim these tax cuts are going to pay for themselves," said Marc Goldwein, senior vice president of the Committee for a Responsible Federal Budget. "Certainly, they haven't to date, and there's no evidence they will in the future." Trump promised to promote fossil fuels, and last year the U.S. became the world's largest oil producer. Natural gas production is also booming, thanks to the same "fracking" revolution. While these trends began during the Obama administration, Trump has definitely encouraged them, said Daniel Yergin, energy historian and vice chairman of IHS Markit. "Sometimes it seems that the world's No. 1 natural gas/[liquefied natural gas] salesman is Donald Trump," Yergin said. Trump has championed oil and gas drilling both offshore and on public lands. His support has not sparked a similar boom in the coal fields, however. Coal continues to lose market share for electricity generation in the U.S., partly because of competition from cheap natural gas and increasingly affordable wind and solar power. 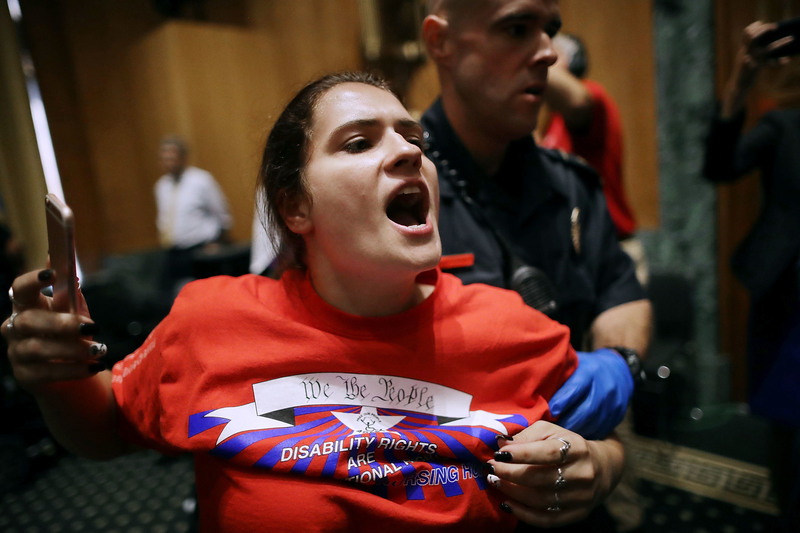 U.S. Capitol Police arrest protesters who disrupted a Senate Finance Committee hearing about a health care proposal to replace Obamacare on Capitol Hill on Sept. 25, 2017. While the president keeps chipping away at the Affordable Care Act, Trump has yet to deliver on his promise to repeal and replace "Obamacare." "The core of the ACA is still standing," said Drew Altman, president and CEO of the Kaiser Family Foundation. "It's still there. And politically the law is more popular than it has been." Obamacare's Medicaid expansion has now been extended to 37 states, including several additional red states where voters opted into the program last year. Enrollment in the federally run insurance marketplaces dipped less than 5 percent this year, even though there's no longer a tax penalty for people who go without insurance, and the administration has fostered a variety of skimpy coverage alternatives. Democrats made preservation of Obamacare's protection for people with pre-existing medical conditions a centerpiece of their midterm campaign. "As a result of the repeal and replace effort, Democrats are on offense now on health care and Republicans are on defense," Altman said. Trump boasted about his efforts to cut red tape this month in a speech to the American Farm Bureau Federation, telling farmers he'd delivered "the biggest cuts in regulations in the history of our country, and we're going further." "He certainly has tried to do what he said he was going to do," said Peter Van Doren, senior fellow at the libertarian Cato Institute. Van Doren cautioned, however, that much of Trump's push for deregulation could be stymied in court, unless the administration can establish a factual rationale for the proposed changes. "You can't just say you want to change this rule because we won the election," Van Doren said. "The law doesn't allow that." 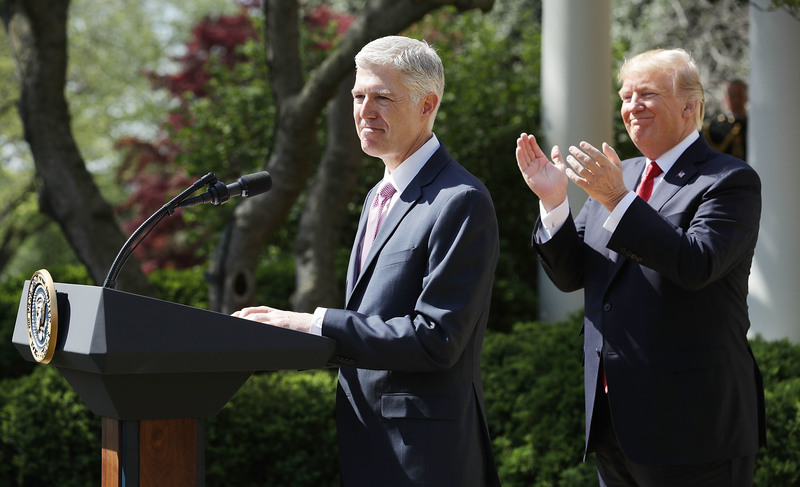 President Trump applauds as Supreme Court Associate Justice Neil Gorsuch delivers remarks after taking the judicial oath in a ceremony at the White House Rose Garden in April 2017. Getting a justice appointed to the court was a key campaign promise for Trump. As with the Supreme Court, most of Trump's appellate court picks have replaced judges who were also nominated by Republicans. So Trump's accomplishment is not so much creating a conservative court as locking one in that was already there. "Now, obviously if you replace a 70-year-old, slightly to the right appellate judge with a 45-year-old, fire-brand conservative, you're not trading apples for apples," said Russell Wheeler, who tracks judicial nominees at the Brookings Institution. Wheeler suspects Trump will not have as many appeals court vacancies to fill in the second half of his term. But the judicial appointments he's already made will be delivering on the president's promises, long after Trump leaves office. Trump promised to weed out corruption in Washington by establishing new limits on lobbying by former administration officials. But watchdogs say in some cases, the new limits are less restrictive than ones already in place. "I think the revolving door is operating much as it always has and maybe a little faster and more vigorously than it did prior to President Trump coming in," said Walter Shaub, former director of the Office of Government Ethics. Conflicts abound within the administration, including many officials who now regulate the industries they used to work in. What's more, three of Trump's Cabinet officials resigned in 2018 under ethical clouds. "I think he's been filling the swamp with more alligators, rather than draining it," said Shaub, who's now a senior adviser for the watchdog group Citizens for Responsibility and Ethics in Washington. President Trump has suggested that he might resort to using "emergency" powers to build his border wall if he is not able to reach agreement on funding with congressional Democrats. "We are looking at it very strongly," Trump told reporters on Sunday. "We're looking at a national emergency, because we have a national emergency." The president does have broad powers to act in a crisis situation, but those powers are not unlimited. And critics say Trump should be careful about invoking them in this instance.